Happy Monday! I have 2 personalities to introduce you to today. The first one is Smiley Bob. My 12 year old DD named these guys while we were stamping them one night and the names have stuck (no wonder Faith names all of her stamps) My friend Heather came over last week and we got to play with some new stamps. I haven't bought these adorable stamps yet..so I begged Haether to bring them over for me to play with. Hehe, they are so fun...I will have to give in and get them! 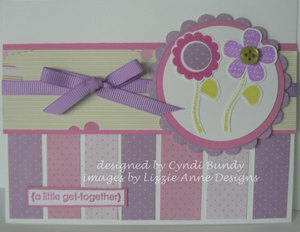 The set is from Lizzie Anne Designs called Gizmos and Gears. There are all kinds of fun pieces in the set, but 2 main robots...this one and the other (you guessed it, Mickey Mo). I started off with an old WSC from Beate from weeks agao, but it kinda changed a bit I think. The fun paper is PERFECT with this set...Cosmo Cricket Cogsmo. And the colors in the stack are an awesome match with the SU! new In Colors...BTW... the new SU! catty will be here in 1 week!!!! Tons of new stamps! So, here is Mickey Mo...where on earth did she get that name??? He was soooo fun to color in! I pulled out all the funa colors from the Cogsmo paper. Not too much special about the card, except now I have 2 new cute ones for my boy stash! Happy Monday! Hope everyone had a great weekend...ours was pretty lazy, and I like that! Only 4 weeks of summer til life gets crazy again so I will take all the lazy days that I can get! I will have lots of peeks starting up in just a few days for CC Designs and H&M Stamps, but in the meantime...a little other stuff. I pulled up the Lizzie Anne Designs sketch challenge the other day and tried to do a card with the cute new robot set...well that didn't work out so well. I do have a couple of fun cards made with that set that I'll show you another time...but today I thought about that darn "easy" sketch again, then thought about this gorgeous set, "Le Jardin" that I won during the last LAD release party. well...it worked this time and I love the result! Not my cutesy normal, but the colors turned out fun and bold!! 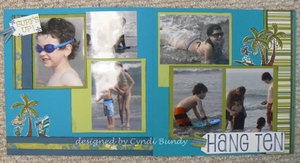 The other part of the challenge was to create you own background paper, which I did for the card base! 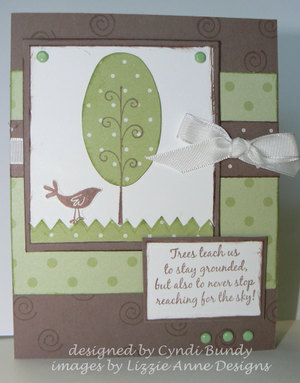 I made this card last week for the sketch challenge at SCS, I uploaded it there, but it never made it here somehow. I love the sketch...very fun and different and it was a bit of a challenge too. The papers are from a scrap pad by Me & My Big Ideas. The stamps are a fun set that I borrowed from my friend Heather called By the Sea...it was one of LAD's last releases that I didn;t get. They have a ton more coming this week BTW...head over to check out their Anniversary Celebration...there is a sketch contest, and tons of peeks!! I am off now to go birthday shopping with my DD for her party tomorrow! I finally got to do another of Beate's weekend sketches! I have missed these! I have been wanting to pull out my new fairy from Lizzie Anne Designs for a couple of weeks and decided that today was the day. I am not totally happy with this card. I think the fairy kinda gets lost with all that pattern paper. But I was ALSO determined to use my new SEI Dill Blossom paper. LOVE it!! Sometimes I should split up my determination between 2 cards though, huh? Well, I'll try again later with her I suppose. IRL she is much prettier and VERY glittery...I added a lot of sparkle to her wings, crown, wand and stars with my Gelly Roll Glitter pen. The fairy saying is also by LAD. 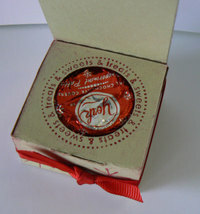 The ribbon is Chocolate tafetta from SU! and the brads are Bazzill I think. Hello from Florida! Again, you ask? Yes, we are back in Orlando, but not at Disney, and not with the kids. This trip is a bit shorter and is "business" for my hubby. Business means a few meetings, a lot of fabulous dinners, live bands, golf & pool. I have some cool stuff to share later, such as we heard President George Bush Sr. speak to our group, how cool is thst? The man is 83 years old and is still quite humorous. The speech was not political in the least, more on values. Lots of family anecdotes. Don't know if I can share a pic online? Anyway, I had just received my free set that I won from Lizzie Anne Designs right before we left, so I threw it and a few copics and some paper in a craft keeper. I had fun creating this yesterday, but didn't have time to post it. I need to be quick so here's the nitty gritty on supplies: stamps: Le Jardin by Lizzie Anne Designs, greeting from Thankful Florals by Verve Visual; ink: Palette & copic markers; CS: SU! black & celery; paper is Amanda Blu; ribbon is SU! ; dimensionals. I know that I have said this before, but its is so true...Lizzie Anne Designs ROCKS!! I just won a new release stamp set last night on the Stamp Safari! I am so excited!! So, in honor of Tricia (Lizzie) and Meredith (Anne) here are a couple of cards using one of the sets from the last release: In the Treetop. I stamped the top of this tree on the back of the polka dot DSP then cut it out and adhered it to the white piece, then stamped the tree bottom over the top of that. The grass was stamped with the little zig-zag from that set on the same DSP and then cut out. All pieces are distressed with the 2 color pads. The next card I actually made over the weekend for last weeks sketch challenge (the twist was to use circles) I used the same set, but had some fun with the colors. I pulled the colors out from Bo Bunny DP...the pads are SU! Cranberry (retired), Groovy Guava, and CTMH Kiwi. I used the pretty heart border stamp from the Lizzie Anne Designs set L'Amour (still one of my all time favorite sets!) and stamped it 4 times in Temting Turquoise around the outsides of a white square (the middle was punched out using a square punch repeatedly). I then colored in the little hearts with a Green Galore marker. So, I decided to frame my little cat, Roxie. Its not as if we don't have a gazillion pictures of her! 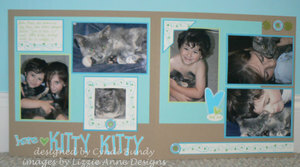 I pulled out some more photos from around the same time and backed them all with Turquoise and Gable Green. The background pieces are Kraft, and the next large mats are Cool Carribean. I added a few more pieces using the same heart border theme (across the bottom of one page, on a corner mat, and at the bottom of the journaling) to bring a little balance to the pages. 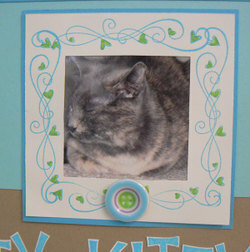 The alphabets are Pupcat (retired from Lizzie Anne Designs) and Spunky (retired from Stampin' Up!). I also added a few hearts, the little ones are also from the L'AMour set, the large one is from a SU! set called Foerever in my Heart. The buttons are all Doddlebug (I think). I realized the other day that my Lizzie Anne Designs stamps have been feeling neglected. I got so caught up in scrapbook pages that I laid aside all my new stamps that were hardly played with...so sad!! So, here is a card for the latest LAD weekly sketch challenge (well, last weeks actually). This challenge came with an additional twist...I had to use a stamp that has never seen ink!! Hmm, not too hard, except for my LAD stamps, all have been stamped at least once...except for "Its a Party". So, thats what I had to use! The cute little flowers are both from this set, as is the sentiment. I used Orchid Opulence, Pixie Pink, and Kiwi, inspired from the pattern paper that I used...Marcella Princess Paper. The stems are from the set Funky Floral, also by Lizzie Anne Designs. I added a button to the center of one flower (Foo-fa-la), and a punched circle to the other. 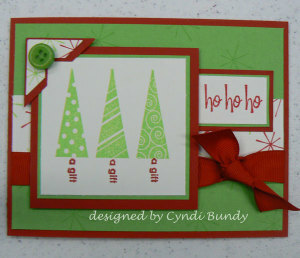 The circle and scalloped circle were cut using my Nestabilities Die cuts run through my Cuttlebug. This is for CC154 over at Splitcoast and also for Lizzie Anne Designs sketch #15. 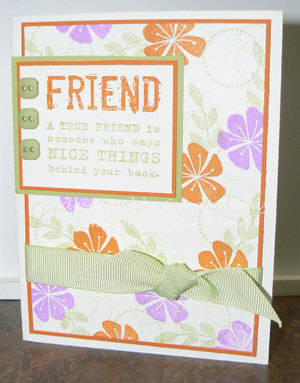 Don't you love a double challenge...the layout and colors are all picked for me, I just have to choose some stamps! 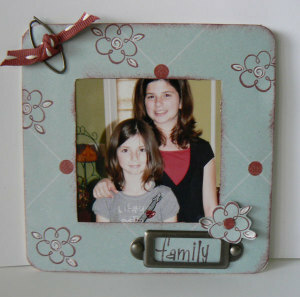 For this I chose LAD Funky Floral which you can find on the Lizzie Anne Designs website. The colors are Pumpkin Pie, Orchid Opulence, and Certainly Celery. Kinda fun! I layered the flowers over the background swirl design to give it a bit of depth. But otherwise the layout was pretty simple, so I tried to keep it simple. The sentiment is done with markers using That's Nice, a retired SU! set from last year. 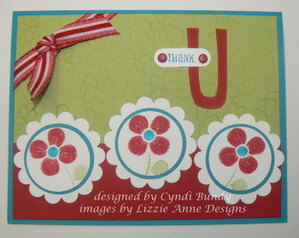 The buttons and ribbon are also from Stampin' Up! 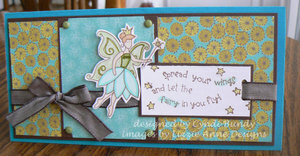 I was in a bit of a whimsical mood today, so I pulled out some of my new Lizzie Anne Designs stamps. 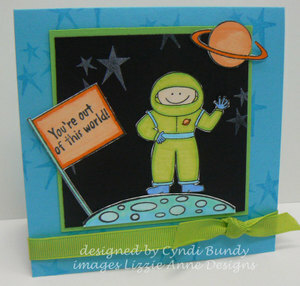 These cute little LGMs are from "out of this World" available at Lizzie Anne Designs website. Now I can't get Buzz and the LGMs out of my brain..."the uni-mind", bwaaha. Anywho...the stamps from this set are very fun to color. The first card uses just 5 of the images...all colored with my copic markers. Besides the aliens, the ufo (how cute is that?? ), and the sentiment, both backgrounds are in the set. 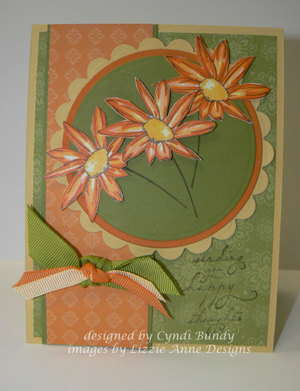 I used Whisper White craft on the pumpkin cs and Gable Green on the white cs. The next card uses a handful more images...the astronaut, flag, sentiment, planet, and moon. And guess what? I still haven't inked them all up after all those! The possibilites are endless. 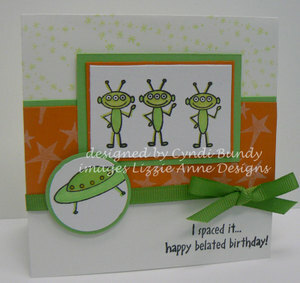 Lots of cute b-day sayings and more planet/star images as well as a cute rocket. I also colored the images on this card with my copics. I love the little craters on the moon! And the flag...its blank so that you can put all the little words or stars in it. Too stinkin' cute! Meredith and Tricia are so awesome! I hope to play some more with these space dudes soon, but I must get back to scrapping this week! I am a week behind on sketch challenges it looks like...this is for Lizzie Anne Designs sketch #10, last week. I hope to do this weeks too because its a fun one! I chose to ink up "In the Meadow" of my new LAD stamps first. I'm not sure why, its not my usual style, but I was in the mood and very drawn to it. There are a variety of beautiful floral images in this set, and very pretty sentiments as well...this one says "sending you happy thoughts". I used SU! So Saffron for the card base and then layers of more of my new favorite Bali Breeze DSP. The circles are cut using my Classic and Scalloped Circle Nestabilities dies in my Cuttlebug. The flowers are stamped on Whisper White and cut out. I colored them in with Copics # Y00, Y17, YR20, YR02, and YR07. The other cardstock mats are Pumpkin Pie and Old Olive...the ribbon is wide grosgrain in Olive, and narrow grosgrain in Apricot and Pumpkin. Anyway, this card uses Funky Floral and Pupcat alphabet. They can be found at the Lizzie Anne Designs website. while there you can check out some sneak peeks of all the new releases coming out on Monday. I can't wait to get my hands on some of these babies! 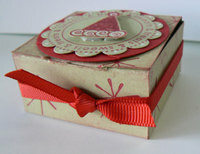 Day 2 of the Sneak Peeks...heres LuLu all ready for Valentines Day. This stamp is from "Love Ya Lots" which will be released Friday night at midnight. 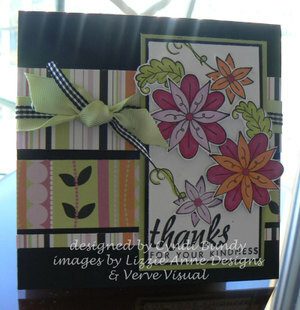 Head over to All That Scraps to check out other CC Designs stamp sets in the meantime! Christine also stocks tons of accessories and tools in her store, and the best part is that shipping is always FREE for any order over $10! How cool is that? Back to the card...LuLu is stamped in Palette Hybrid Noir and colored with copic markers: C3, C5, BV00, RV02, and YG03. I also added some bling with the pink and purple spica glitter pens on the flower. The white background was run through my Cuttlebug with the Heart Blocks folder. I had to use 2 pieces because of the width, then they are pieced together behind the ribbon. 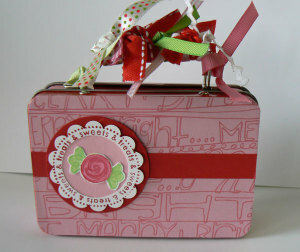 The ribbons are both from Stampin' Up! : basic gray tafetta and pink gingham. The sentiment (also from Love Ya Lots) was punched out with the SU! word window punch...it was a perfect fit! and then attached to the bow with a mini safety pin. The gray brads are from my stash (Queen & Co maybe??) The heart border at the bottom is from Lizzie Anne Designs L'Amour set and is stamped with the SU! Whisper White pad. But, for cards, I took on a few challenges this week and thought I'd pull out some different sets and papers. 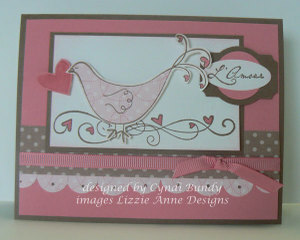 This card is made with L'Amour from Lizzie Anne Designs. This is the first set I bought from LAD, and possibly still one of my favorites! I am anxiously awaiting the new releases in January!! All other supplies for this card are Stampin' Up! The cardstock is Regal Rose and Chocolate Chip, the DSP is from last years Valentines line, but I don't remember the name. I paper pieced the bird with the same paper that is used for the scallop border. 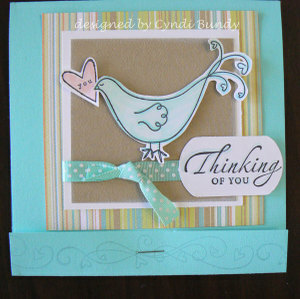 The bird and the heart are popped up with Stampin' dimensionals. So many sketches and challenges, not enough stamping time! 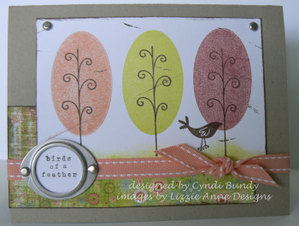 This card is for the Lizzie Anne Designs WC_3 over at Splitcoast Stampers. I love that SCS has all the new member companies and their forums, challenges, chit-chat, etc! The dot paper is layered on SU! Certainly Celery. The main panel is also Celery, layered on Whisper WHite and more of the BAzzill red. 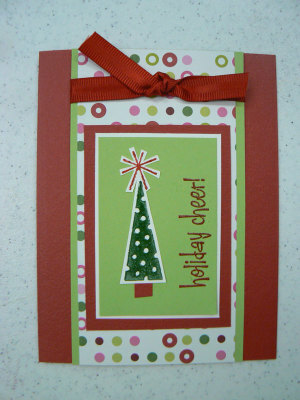 I embossed the "Holiday Cheer" sentiment in Ruby Red Craft Ink with Crystal Clear EP. 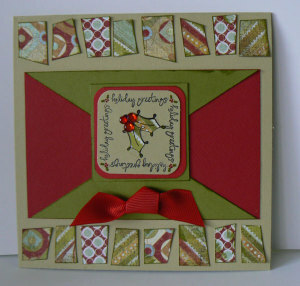 The sentiment and the tree and star are all from the Lizzie Anne Designs set "Holiday Cheer". You can visit their website HERE. 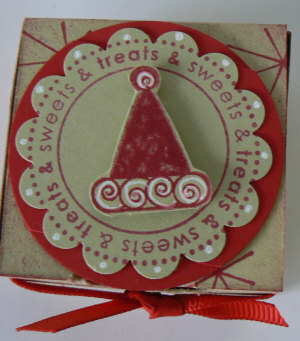 The little tree was also embossed with Garden Green, the star with Ruby REd. The base of the tree is a bit of scrap cardstock. The red ribbon I love! Its been in my stash for some time now, and yes, I have been hoarding it. But it was also a perfect color match for the reds...so time to use it up! 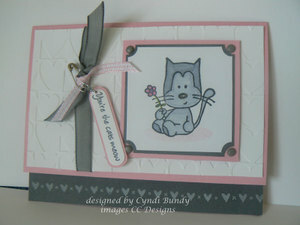 It was made using the stamp set L'AMour, the cardstock is Bazzill, the paper is from Crate Paper. You can visit the website at: Lizzie Anne Designs. They have a lot of beautiful samples including some great new projects of the month. I love all their stamps, and in honor of a winning card, I made up another card with their stamps with my newest set by LAD: Holiday Cheer. It is stamped in Green Galore and Real Red (SU!). I added a button from Autumn Leaves and some wide grosgrain ribbon, but otherwise its a pretty simple little Christmas card. The little trees didn't have a base, so I inked up part of the sentiment "a gift for you" in red marker and used that as the trunks. The background star is also from the same set as is the HoHoHo.